I make a lot of original work, and almost all of it is clown theatre. In addition to my theatrical clown projects, I perform zany, interactive, family-friendly magic shows at parties and corporate events. 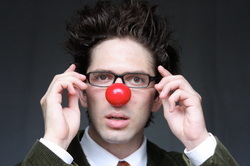 I'm also the resident pediatric clown at three different Brooklyn hospitals. How did I become a clown? In the fall of 2008, I ran home and joined the circus - I moved to NYC and started working for New York Circus Arts, rehearsing lead roles for two new shows. Although these workshops productions never made it to their planned off-Broadway runs, this was still a pivotal time for me. I fell in love with clown and I was able to integrate my new acrobatic training into my background in improv, movement, magic, stage combat and Commedia dell’arte. Subsequently, I started producing new clown theatre with Doppelskope. I also studied clown with John Leo.